David Letterman has been a part of the talk show world for well over three decades and, on Wednesday night, David Letterman's final show will end the legendary host's tenure. Over the years, Letterman has introduced us to Stupid Human and Stupid Pet Tricks, the Hello Deli, Will it Float?, Is this Anything?, and, his most famous bit of all, the Top 10 List. Before the Internet had memes and gifs of people falling down, David Letterman knew that keeping lists short and sweet was a perfect formula for comedy. Throughout The Late Show's run, the Top 10 has been a staple of late night comedy, and has featured some incredible guests, including United States Presidents, rock and roll legends, and Hollywood's finest actors — all of whom David Letterman convinced to say some ridiculous things on national television. What I adore about the Top 10 is the way Letterman interjects his own commentary after each item. His delivery is dry, sharp, and uniquely endearing. The Top 10 is where I get to see Letterman really riff, and he's got the kind of chops that few comedians ever have. There was something rebellious about Letterman's blend of comedy, and the Top 10 was a testament to that — it was as edgy, subversive, and smart as much as it was downright silly. Here are the Top 10 of David Letterman's Best Top 10 Lists. Letterman never strayed from politics on his show — and he gave everyone a hard time, no matter what their party affiliation. Sentimental and hilarious. 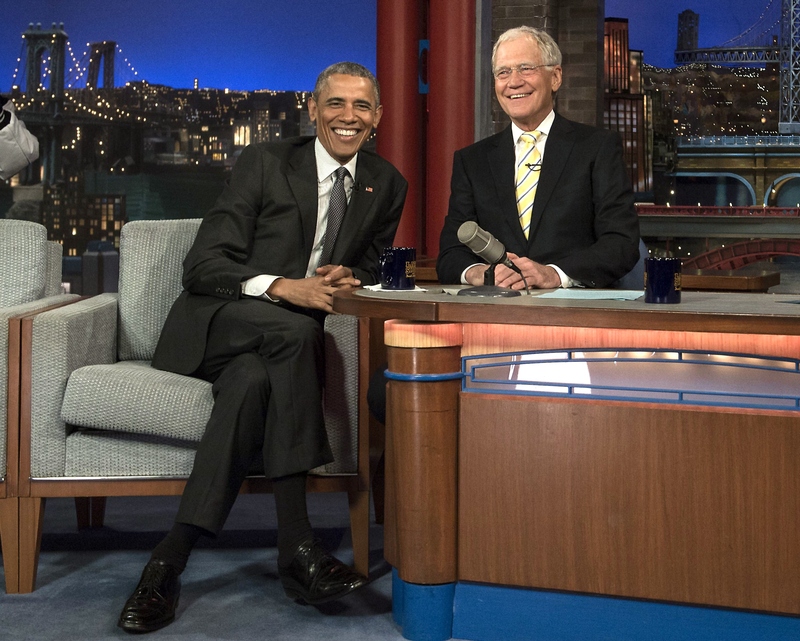 Letterman is a huge Foo Fighters' fan, and has supported the band since they started out. They were also his first musical guests after recovering from his heart surgery. This is a very special Top 10 for many reasons. Because Homer Simpson SHOULD be President. Even next to Snoop Dogg, Letterman is still cooler than almost everyone. The yin to Snoop Dogg's yang. It's two of the greatest living actors dead-panning jokes about pudding. It's everything Letterman and The Late Show stood for. You know it's good when this many serious actors are so tickled on air. Bless the intern who did this research, for you are the founding father of Internet humor. It's a relief to know that our President hasn't lost his sense of humor since the first election. It's so simple and spot on. The Top 10 grew from words that almost rhyme with peas to platforms for presidential hopefuls. Well done, Mr. Letterman, you'll always be my No. 1 host.